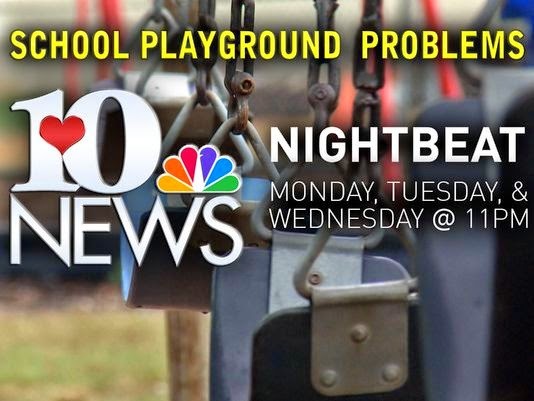 On Monday, Tuesday, and Wednesday night of this week at 11 p.m., WBIR 10News examines school playground safety standards. These stories are the result of a four-month investigation of 29 school systems in East Tennessee. We know there is always an inherent risk of injury when groups of children run, jump, and climb at any playground. Kids are kids. They take risks and get injured. That is not what this investigation is about. We're examining safety issues, problems with playground equipment, and scheduled inspections that can be reasonably changed to reduce the unnecessary risk of additional injuries. Children were injured on school playgrounds due to equipment problems that can be prevented and/or corrected. Many known problems with equipment have been identified, but have not been repaired. Children continue to play on these items several months after hazards were identified. School unawareness of manufacturer recalls for dangerous playground equipment has led to injury and potential litigation. Taxpayer money has been spent to pay for medical bills caused by problems with playground equipment. Our examination of school systems' safety protocols shows a wide variation in how each district ensures its equipment is safe. There is not a consistent standard from one school system to another. In several cases, school districts do far less than the industry standards applied at many public park playgrounds. We'll show you how your local school system stacks up on safety. There will be some overlap in the web stories and the TV stories, but each will also be fairly unique.